The Hero I League match between Minerva Punjab FC and East Bengal FC on Tuesday at Tau Devi Lal stadium was a pivotal encounter in the title quest between the two teams. 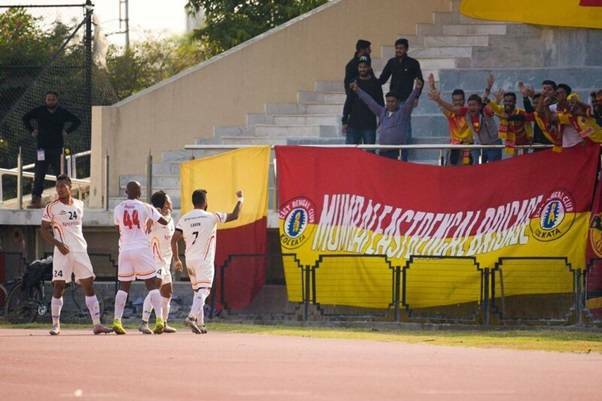 Minerva FC went into the match having pole position in the league table with 29 points from 13 games, while East Bengal had 23 points from 13 games. In the context of the title chase, the match was at juxtaposition for two teams as a win for East Bengal could bring them within sniffing distance of Minerva FC and oppositely a loss for Minerva FC could mean the title chase to be open for three teams including NEROCA FC. East Bengal Coach Khalid Jamil started with Mahmoud Al Amnah in the starting lineup pairing with Katsumi and Kevin Lobo in the midfield. Dudu played upfront with Laldanmawaia Ralte and Yami Longvah on both flanks to provide width and aerial supply from the wings. Minerva Punjab FC started with William Opoku upfront with Chencho and Souvik Das managing both flanks and former East Bengal defensive midfielder Bazi Armand paired with Kassim for the midfield role. East Bengal came out with purpose as they dominated the early proceedings and fired an early warning on the 19th minute as Kevin Lobo’s powerful volley missed the target narrowly. The chance of the first half came on 33rd minute as Dudu found himself with some space in the Minerva half and selflessly played to Yami Longvah who made a good run into the box but Yami failed to score from the one-on-one situation and was substituted soon by Kromah. East Bengal survived a scare of conceding an own goal in 35th minute when Souvik’s harmless cross into the box strayed off Eduardo’s header to land on the roof of the net. Both teams went into the halftime having failed to score in the first-45. In the second half, both teams came out with some intentions as the game opened up for end-to-end to action.0n 46th minute Dudu failed to connect with Salam Ranjan’s low cross from the right flank and within moments Bali Gagandeep found himself with space in the box as his left-footed effort was saved by East Bengal keeper Ubaid. The defining moment of the match came in the 60th minute and it was a moment of sheer class from Kevin Lobo as midfielder collected a backheel pass from Al Amna and rounded off his lace around the ball to unleash a venomous shot from 30 yards out to beat Minerva keeper Rakshit who had little chance to save the screamer. Minerva stunned by the goal tried to use the flanks and release the long ball to get behind the East Bengal backline in search of an equaliser and the strategy almost payed-off as Chencho found himself in a good shooting position from outside the box but his volley was saved by East Bengal keeper Ubaid which came at a comfortable height. Chencho was a constant threat to the East Bengal back-four as he managed to get to the end of long balls and managed to round off Eduardo in the box and his quick shot was saved by Ubaid in the near post. East Bengal had a torrid time containing Chencho’s run down the flanks and switching of flanks as he managed to fox the defenders in the box with a clever run on the 85th minute and crossed the ball to William Opoku who was unmarked just outside the six-yard box failed to put his header on target with an open goal in front of him, as chances went unsolicited. East Bengal managed to hold on to the crucial one-goal lead as they snatched a crucial away win to get their title-chase on track with 26 points from 14 games trailing just three points behind Minerva FC as they head to Kozhikode to face relegation-threatened Gokulam Kerala FC on 17th February, 2018.